Halloween just a few weeks away, and for many that means picking out a costume, buying lots of fun-size candy bars, cueing a scary movie marathon, and blaring Bobby Pickett’s 1962 single “Monster Mash” (undoubtably Halloween’s unofficial theme song) on repeat. But, Halloween is also the perfect time to head somewhere that can provide all the thrills and chills that the holiday is known for! So, don your favorite costumes and get ready to trick-or-treat around the Cape Codder Resort & Spa for our fun, family-friendly Halloween celebration. During the last weekend in October, the Cape Codder hosts wickedly entertaining events for both kids and adults, with rates starting as low as $219 per night for The Haunted Hotel Package. For extra spooky savings, add Friday for a special reduced rate of $179. No tricks, just treats! This is a safe and fun way for families with children of all ages to celebrate Halloween on Cape Cod. Over the weekend, the hotel will be transformed into a Halloween fantasyland, complete with spooky skeletons, ghostly ghouls, haunted mirrors, creepy spiders and pumpkins galore. Take a peek below at some of the spooktacular festivities we have planned, if you dare! The fun begins the moment you arrive! Upon check-in, guests will be able to enjoy a variety of Halloween movies, a spooky fire in our courtyard fire pit, as well as a ghostly Halloween musical light show. Before the night is through, you can eat, drink and be scary at our award-winning Hearth ‘n Kettle restaurant, or the Grand Cru Wine Bar & Grill. At the end of the day, rest your head in one of our hauntingly comfortable rooms or luxury suites. Saturday is packed with spooky activities and ghostly events suited for the whole family! Guests will enjoy festive face painting, Halloween themed arts-and-crafts, spooky balloon games and Halloween movies. That night, get dressed in your best costumes and trick-or-treat in the hotel with our frighteningly friendly costumed staff. Grown-ups can get into the spirit with Halloween-themed cocktails. The whole family can enjoy scary stories around the courtyard fire pit and enjoy the Halloween musical light show. The costume parade and “DJ Halloween” dance party is sure to have all the boos and ghouls dancing the night away! After a thrilling night, sleep in and enjoy a delicious breakfast or brunch. Guests will be able to enjoy late check-out, so be sure to head to the pool one last time before you go. The Cape Codder Resort & Spa offers a wide-selection of comfortable deluxe rooms and family suites, perfect for families of all sizes. When you’re ready to take a break from Halloween festivities, head to the full-service onsite Beach Plum Spa and relax your mind, body and soul. The spa offers a variety of signature services and spa treatments, from relaxing massages to rejuvenating facials, and much more. During your stay, splash into spooky fun at the Cape Codder Water Park. Our 30,000-square-foot indoor water park is the only one of its kind on Cape Cod with a retractable roof, gigantic water slides that wind through a full-size replica of a pirate ship, lazy river, waterfalls, indoor wave pool, kiddie play area, and café. During the last weekend in October, the water park will be lit up at night in a spooky Halloween light display. Or maybe you’ll fancy a swim outside in the crisp autumn air! You may be thinking, “Outside?! At the end of October on Cape Cod?! All the Halloween candy must be getting to them.” Well, you’re probably right about that, but our Rainbow Falls Heated Outdoor Pool is open year round! Join us for a weekend of frightfully delightful family fun at our haunted hotel and make this Halloween season one to remember. 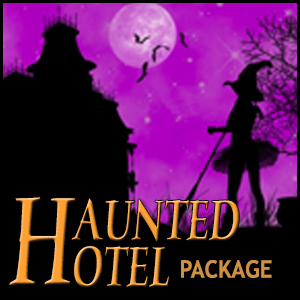 The Haunted Hotel Package is available from October 26th to the 28th.